Music is a great way to express your feelings toward your significant other. Having a lovely dinner to music in the evening of Valentine’s Day is a good way to celebrate the day with your loved ones. There are a lot of romantic songs you can choose that can be compatible with a Valentine’s Day dinner. Below we’ve picked out the top 10 Valentine Day songs for you. Below is an interesting list. There are songs that will have more views on February 14th than any other days. Those songs came from a shared list between Billboard and YouTube. Apparently there is something unique about those songs that make people want to listen to them on Valentine’s Day. Go check them out online and see if they are they are the romantic valentine songs you are looking for. Interestingly, more than half of those Valentine Day songs are not in English. If you are looking of Valentine’s Day Music to lighten the mood for Valentine’s Day dinner or other intimate interaction, you should be able to find the perfect the perfect Valentine Day song from the above lists. Music is an important part of our lives and it can help us express our feelings. Valentine music is not that hard to find. You can directly click on the link above to listen to those romantic songs on YouTube. If you want to download those Valentine Day special songs from YouTube, you are going to need a music downloader. Check out Leawo Music Recorder: It’s a powerful online audio music recorder which can help you record and download any songs you want from the Internet. With it you can easily download all the Valentine’s Day songs as you like. The program is very easy to use. In addtion, you could edit the music tags manually. Check out the instructions below to see how to download those Valentine’s Day songs off YouTube using this Valentine Day song downloader. 1. Launch Leawo Music Recorder on your computer and the first thing you need to do is set the audio source. Click on the Microphone icon in the bottom left-hand corner. On the following popup, choose Record Computer Audio as we are now recording Valentine’s Day songs from online. 2. Next thing to do is to set the output format for the Valentines Day songs recordings. You can save it in either MP3 or WAV format. On the same window, click on the Format tab and then click on the option box next to Output Format to choose between MP3 and WAV. 3. After setting the output format, you’ll also have to set the output directory for the file. Click on General on the same window and then click on the Folder icon next to the Output option to set the folder to save your Valentine Day song recordings in. 4. After finishing the above 3 steps, you may now start recording those Valentine’s Day songs. Click on the Record button in the upper left-hand area and then start playing the Valentine’s Day songs you want to record. That’s how you can download those Valentine’s day songs you like. After downloading them, you can use them for different purposes. The MP3 format makes it easy for you to play it on basically all kinds of media players. Free Sound Recorder is one of the best ways to download those Valentine’s Day music from online Websites. It can capture audio which is playing on your computer and record voice, music or the audio from multiple sources. If you want to record podcasts, create videos, edit audio or more, the sound recorder will contribute a lot in completing these task as you desire. 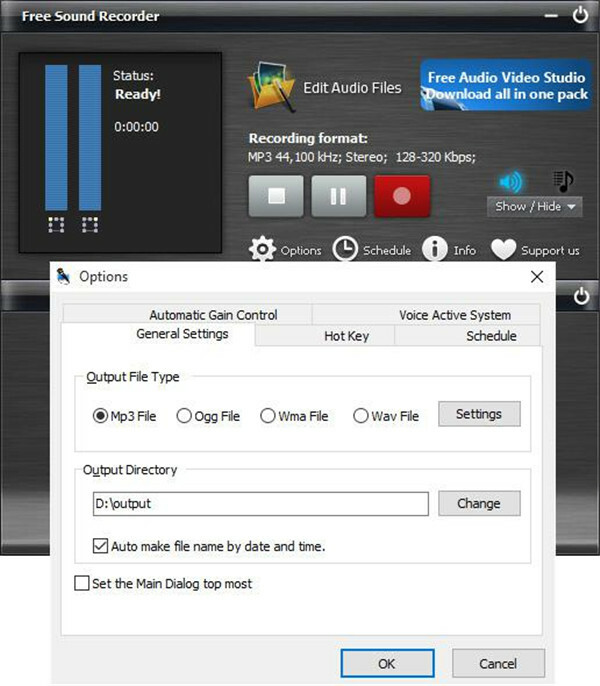 This software is totally free for you and offers the original quality to the recorded audio. Below we will introduce the specific steps of how to record your favorite Valentine’s Day Music by using Free Sound Recorder. 1. 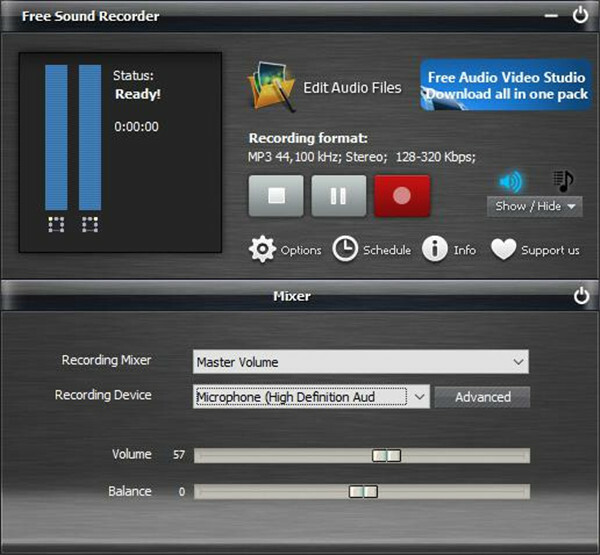 Download and install Free Sound Recorder on your computer and launch it. Then, a microphone must be connected to the input Mic of PC or PA. Or the output must be connected to the sound system of the computer. 2. Select the audio card and audio source. You need to find “Mic Volume” from “Recording Mixer” in the drop-down list and click the button “Show mixer window”. 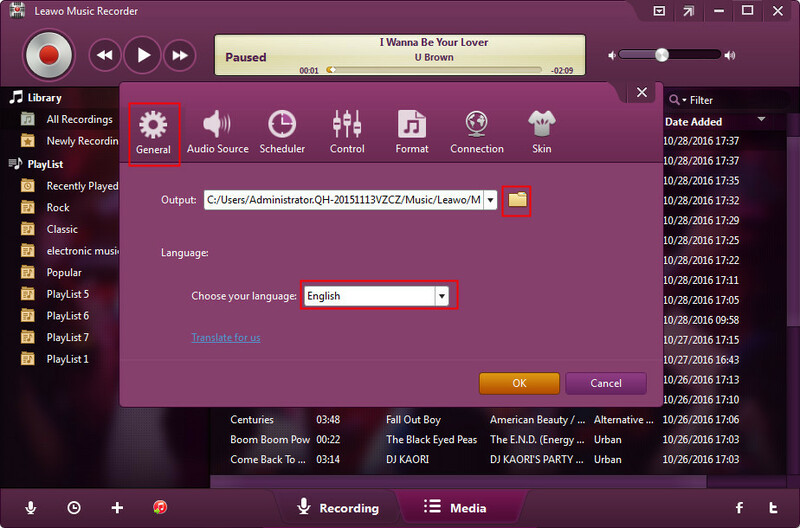 Correct recording device must be chosen from the drop-down menu “Recording Device”. Then, make an adjustment on balance and sound volume. 3. Recording Settings must be adjusted to make the Options window become activate by clicking the Options. 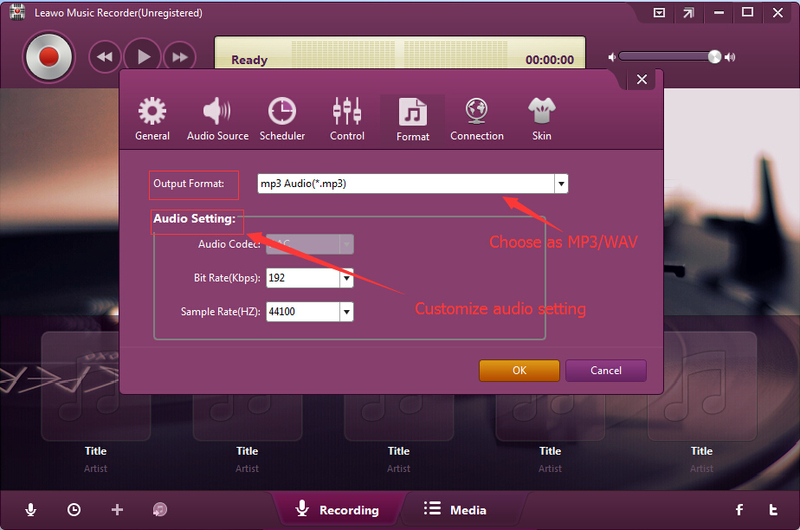 You can choose an output format like WMA, WAV, MP3, and OGG for the recorded audio. You can click “Settings” to set the parameters and specify the presets if you want to control the recording quality. Moreover, the recorded files can be named automatically according to the date and time. 4. 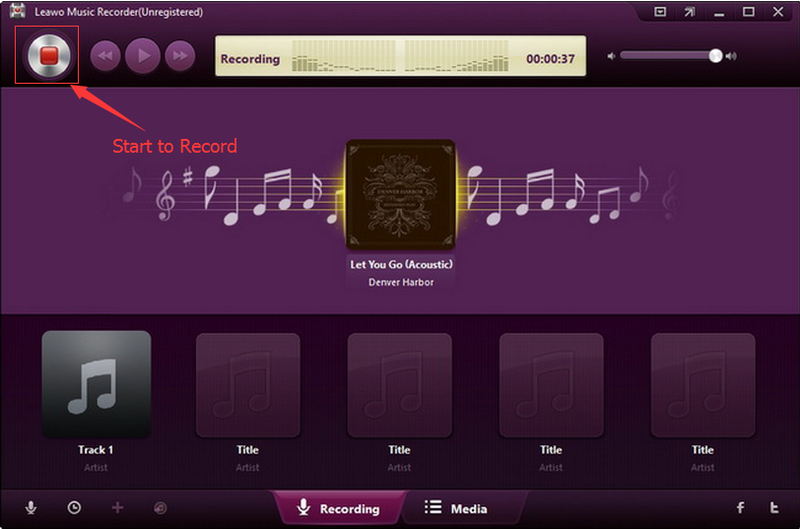 You just need to click on the “Start” button to begin to record and click on the “Stop” button to end the record. The recorded audio will be saved in the target folder and will be displayed in the target folder with the essential information including the location, the file name, the duration and the time. Valentine’s Day music can also be downloaded via online music downloader. 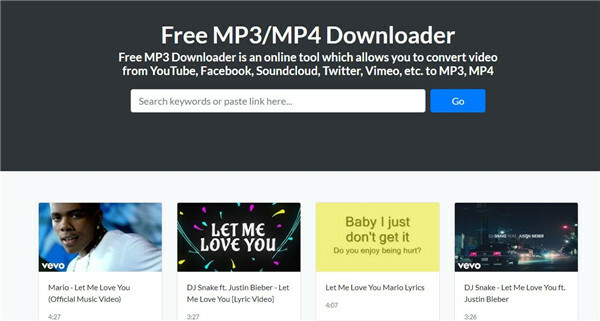 Firstly, you must find an online music downloader website like freemp3downloads.online and then open it through your browser. Then enter the name of Valentine’s Day music or paste the related link of this music on the search bar and click on the button “Go” to find the music you want to download. The Valentine’s Day music video that you are going to download will be listed beneath the search bar. Finally, choose the video you want to download and click on the download button below the video, the audio track will be downloaded and converted into MP3 format automatically for your offline listening freely. To conclude, Leawo music recorder is the most excellent tool for recording music from different kinds of sources, though it just offers one-month free trail version. Due to its versatile functions for recorded music, you can record your favorite music as expected with the customized settings. As a professional music recorder, the music can be recorded in high quality without any data loss. Moreover, it is easy-to-use software which can help you to record your favorite music with simple operation. The recorded music even can be shared to iTunes with one click so that you can enjoy your music via iTunes conveniently and easily.